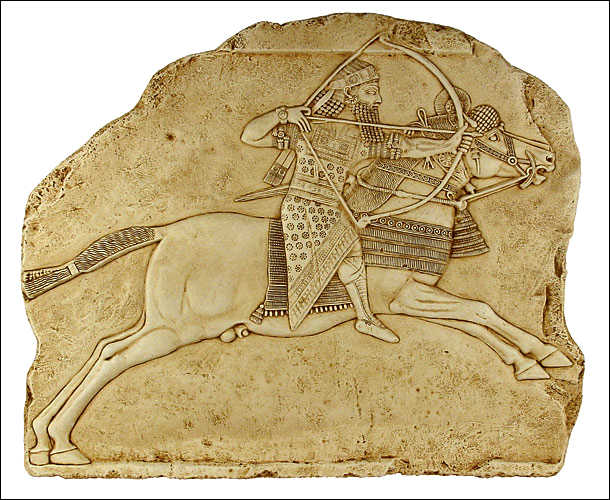 This fragment from a wall originally found in the Assyrian palace of Nineveh depicts King Ashurbanipal as part of a larger scene hunting wild asses with the help of hounds. These animals were considered a nuisance and their killing was a meritorious activity suitable for the king. Ashurbanipal reigned at a time when the Assyrian empire was at its zenith. He waged wars against the Elamites, defeating them in several occasions and also quelled revolts in Babylon thus keeping the empire under his firm control. After his reign however, the Assyrian empire fell apart in the span of twenty years.